Tree-Ripe Cocktail Mix (Whiskey Sour Mix or Sweet & Sour Mix) is a complete blend of fruit juices and flavorings. Perfect for Sours, Collins, Daiquiris always with a thick creamy head. Made with real creamed coconut and pineapple juice. Just add rum and ice for a really exciting cocktail. A combination of Fresh Strawberry flavor with a touch of lime juice. A Tropical Recipe that skillfully blends various citrus flavors to produce this quality mixer. Our formula has been used for over 50 years to make the finest Grenadine Syrup-a rich, red, thick syrup to color and flavor all mixed drinks. Jamaica Gold sweetened lime juice is superior quality with smooth flavor. "It's better and less expensive." A perfect blend of high quality ingredients, never too hot or too bland. Sweet Passion Fruit flavored syrup, tropical, fruity taste. Tree-Ripe non-alcoholic Triple Sec is a unique blend of natural flavors. Great for use in Margaritas, Cosmopolitans and Long Island Iced Tea. A crisp refreshing cocktail from old Cuba. A delicious blend of real Lime. Our Sweet and Sour Cocktail Mix needs only to be mixed with water to make the freshest tasting Lemon Cocktail Mix with the creamiest head you ever tasted. We use only natural flavors and sugar, never any saccharin. Each bag makes one gallon. Lime flavor, all natural flavor, mix with water to make one gallon. Wonderful combination of pineapple and coconut flavors. Each bag makes one quart. 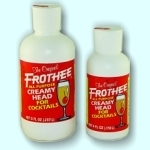 The original all purpose Creamy Head for cocktails.